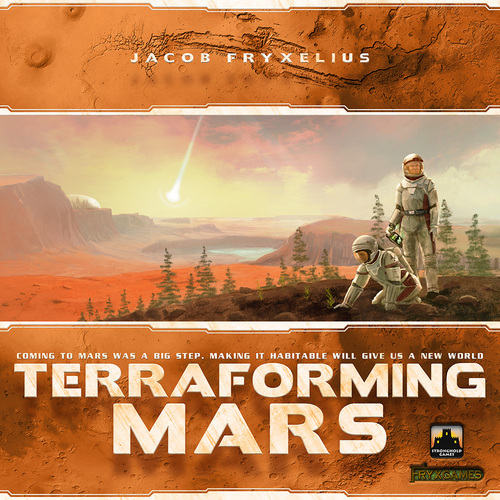 Terraforming Mars is a tableau-building, engine building card and board game for one to five players. While a solo game can be done in an hour, more will mean two to three hours (so if you want to play with five people, you’re in for the long haul). The 12+ age rating is justified, as there is a lot of symbology and writing on the cards and it has a long play time – but the mechanisms are pretty straightforward (no more than medium gamer complexity). And yes, the theme is in the title. Each player will be managing a corporation hoping to make its name by most successfully completing terraforming projects on Mars. 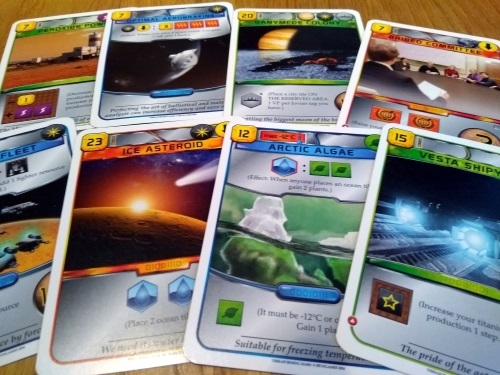 I think the theme comes through well, as designer Jacob Fryxelius has clearly gone the whole nine in making the cards make thematic sense – and has managed to do so without a dice or a plastic miniature in sight. The component quality is open to debate. The board is clear and functional, the 400 plastic cubes and 80 cardboard tiles perfectly serviceable, and the player boards super thin but functional (for the majority of players). But the 230+ cards leave a little to be desired in quality, and the art is a strange mishmash of drawings and photographs. Personally I find this strangely endearing, but I understand it’s a problem for some so you may want to take a close look at an opened copy if that sounds like you. For a group of new players the game can be daunting, but once up and running it’s surprisingly fluid and simple. You only need one experienced player to make things run super smoothly, and even if you don’t have that luxury a group of gamers will easily be up and running by the middle of their first game. Between you, players will be collectively (but competitively) increasing the temperature (creating heat), oxygen level (largely through placing vegetation tiles) and sea level (ocean tiles) to make the planet habitable. Each time you increase one of these you’ll improve your ‘terraforming rating’ – which is a good thing, as it equates to both your income each turn and also the starting base of your endgame score. Once all three have been raised sufficiently, the game will end. The majority of actions you’ll take in the game will be via playing cards from your hand. Each turn players will be dealt four new cards, which they then decide if they wish to hang on to: each will cost you three money to keep, with the rest simply discarded. As this is done simultaneously, it’s not really a chore. Players then play cards (or take other actions) in turn until everyone has passed, which triggers the next round. Cards give you an immediate benefit, an ongoing one, or both. Many give you ways to increase your ability to create plants or heat (raising your terraforming rating), while others help raise your income (opening up the ability to play better cards, as well as having more flexibility in playing basic actions). All the important actions can be done simply by paying for them, but this is always less efficient than card play – it just means you can do it when you like, if you can afford it. But the game has many subplots running alongside the main goal. There are cards that give end game victory points, awards for finishing certain goals first, plus awards for being the best at certain things at the end of the game. While many of the better cards need certain conditions to be met before they can be played: you may need to have played a certain amount of cards with a specific symbol into your tableau, or need the game to have reached (or not passed) a certain point to be valid – for example, the temperature may need to have reached a certain level. While the game has a variable end time, all paths lead to Rome: most things you do are pushing the game towards its conclusion, so games tend to last a similar amount of turns and ramp-up significantly, and satisfyingly, as the game reaches its climax. But multiple paths to victory and different starting corporation powers for each player means every game feels significantly different. The writer: The three paths needing to be completed in Terraforming Mars make each game a very different tactical battle. You only want to spend enough to make hay until a path maxes out, as every penny spent could be used elsewhere. Another nice tactical element is the simple addition of being allowed to play one action, or two, on each of your turns. This can equal extra considerations in several situations, such as trying to stay in a round to see what opportunities – or taking a double turn to secure some a bonus. The thinker: While this is clearly a well-designed game deserving of praise, it’s not going to appeal to all strategic players. The 200+ unique cards and multiple strategies mean luck of the draw can very much damage your chances: not idea in a game that can last several hours. Some have turned to drafting to get around this, but for me it is not an adequate solution. It merely moves the luck, rather than solving the issue, while bringing in a player’s seating position as an additional issue (sitting left of a hate drafter, or a player keeping the best cards for them), will make a big difference). I certainly wouldn’t play with more than three players. 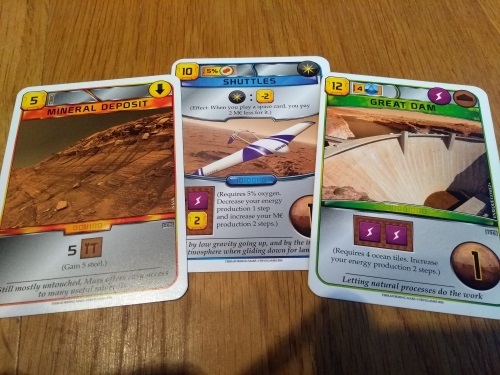 The trasher: Terraforming Mars is a winner for me despite its length. Interaction is limited to a little board placement and a few minor ‘take that’ cards, but I love having to deal with the random draw. Other great elements include trying to eke out any possible advantage to win an award at the end of the game, to beating your opponents to a bonus through a smart double action. I also like the fact your engine can be evolving radically right up until the final turn, allowing a smart (and lucky) player to really play the table and roll with the punches. The dabbler: When I first look at the massive deck in this game I was tempted to run to the hills – so many different ‘cards with words’! But after a few turns things start to make sense and the theme just works. The symbology is simple after a while and if a card looked a bit much I simply discarded it lol. While all the cards may be different, they’re essentially different ways to do the same core set of things – most of which work in a straightforward way: when you get enough of A, you can do B. Sure, pretty much everything could’ve been prettier (except the ‘Pets’ card!) but in a complex game I’ll take function over form this time. Not that I have a load of experience with them, but Terraforming Mars has quickly become my favourite solo board game experience. The game plays in exactly the same way as usual, meaning you don’t have to deal with ham-fisted solo mechanisms – while the massive unique card deck and multiple starting corporations are already enough to make every game unique. The big challenge the solo game offers is trying to get all three of the paths completed in a very limited amount of turns. At first this seems impossible, but the speed at which you can get things done really ramps up as the game goes on – making for a great narrative arc. Also the fact you have to do everything makes a nice change of pace from the competitive game, where you’re jockeying with your opponents and able to ignore certain parts of the game. 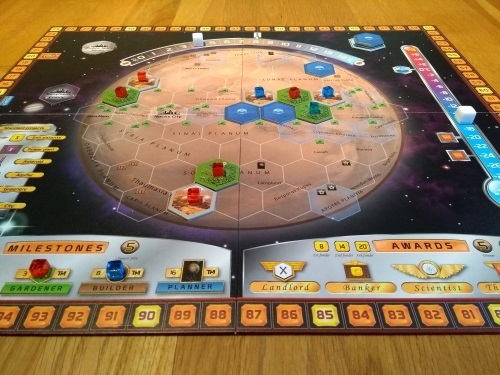 While Terraforming Mars has proven hugely popular since its release, it certainly isn’t for everyone. And two (often linked) problems more often than not rise to the surface. First is the luck inherent in the random card draws – second is game length. For some, the card choices are obvious each round – if you have any good choices at all. I would argue this tends to balance out over a game, as you’re seeing a lot of cards, but sure: some players are going to come out of this process better than others. When you combine this with the game’s length, especially at higher player counts, it’s no surprise more strategic players get frustrated fast. Downtime can feel interminable with five players, even for a fan such as me; especially as very little your opponents do on a turn is likely to change your plans. You’re just waiting for your next turn. This doesn’t seem to be an issue in my groups, as one negates the other: easy decisions means fast turns, while the slow bit (deciding what to keep) is done simultaneously. But I can see this being a nightmare with new, slow, AP prone players. While I had no big problems with the rulebook, it has been flagged up as problematic for some players. When you combine that with some component issues, it’s easy to understand why some also grit their teeth at the game’s relatively high price point. Again, I have some sympathy with this – and if you’re in any doubt, try the game before you buy where possible. Personally, there’s nothing in the box component wise that really bothered me – and its high replay value means I’m happy with my purchase. A point I’ve read several times is, instead of playing this why not just play Race for the Galaxy four times instead? But for me, the two games really complement each other. I love Race, and it’s still my favourite game, but Terraforming Mars is high in my top 10 game list. It scratches a similar itch, but it’s more than just ‘Race with a board’. You not only get to build an engine, but you also get to use it and really see it purr – where in Race the game ends just when things start to get interesting. It’s nice to have this as a slower alternative. I wouldn’t defend or recommend the game to a strategist, as it is unlikely to appeal (unless they’re an absolute Mars nut). Nor will I defend the price point, although I understand the high initial cost of having to pay for all the art (as amateurish as much of it may look). And I’d really rather not play it with four or five players. But on my own or with a couple of friends, this is currently one of my favourite gaming experiences – and that is with my plays already well into double figures (and a couple of expansions available to me if the sheen starts to come off). This entry was posted in Board games, Games and tagged board game reviews, card game review by Chris Marling. Bookmark the permalink.